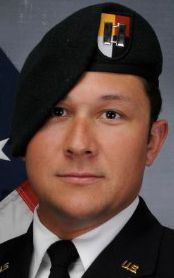 29, of Lexington, Virginia, died Nov. 27 from an improvised explosive device in Ghazni province, Afghanistan. Three other service members, Sgt. 1st Class Eric Michael Emond, Staff Sgt. Dylan Elchin and Sgt. Jason Mitchell McClary also died in the same incident. Ross was assigned to 1st Battalon, 3rd Special Forces Group at Fort Bragg, North Carolina.